Start learning about community telepharmacy today! Our telepharmacy beginner's guide will teach you all of the basics, plus a little more. Get your free copy today! Remote dispensing is a somewhat new concept in community pharmacy. 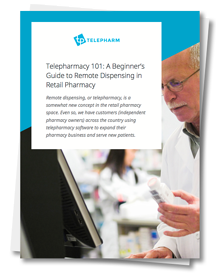 Even so, independent pharmacy owners across the country using telepharmacy software to serve new patients in rural and urban communities, expand their pharmacy footprint and improve financial performance. Download our beginner's guide for more information!